Both had been Ridgefielders, father late in life and son, early. And both died young. James graduated from Canterbury School in New Milford, then Georgetown University, and served in the Army during World War II — entering as a private and winding up a captain. After the war, he became secretary of the company and then in 1950, president. 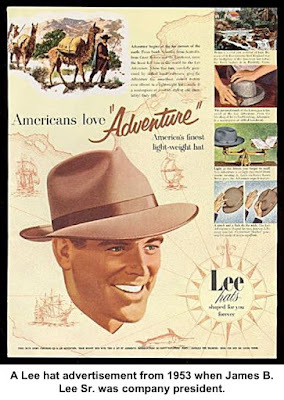 But in 1960, when classic felt hats had become less popular, he sold Lee to Stetson, famed for its “western” style hats. Lee Hat had had as many as 1,500 employees in its heyday, but by the time of the sale, only 220 people worked there. 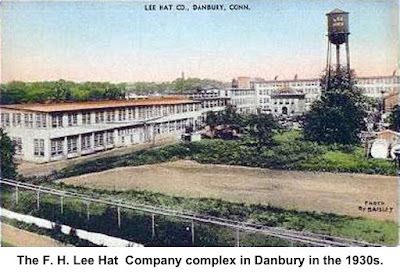 Four years later, Stetson shut down the huge Danbury factory near where the state Motor Vehicles Department is today. the Danbury Times, which eight years later merged with the Evening News to form the News-Times. The paper remained in the Lee family until 1960 when it was sold to Ottaway Newspapers. James, who lived for many years on Wilton Road West, seemed more interested in the broadcasting side of media. He was president of and the main stockholder in the Berkshire Broadcasting Company, which was then principally WLAD Radio but is now a half dozen area AM and FM stations, including the former WREF — now WAXB — in Ridgefield. An accomplished golfer, Lee was a longtime member of the Ridgewood Country Club in Danbury, was its golf champion several times, and also placed near the top in state amateur tournaments. James Sr.’s survivors included his wife, Mary, two daughters, and a son, James B. Lee Jr., who was only 11 years old and a student at Veterans Park School. Jimmy, as he was known then and throughout his life, was also attended catechism classes at St. Mary’s. Jimmy, who was born in 1952 in Manhattan, continued in the Ridgefield schools through freshman year at RHS in 1967 when he was elected class president. He would have graduated in the Class of 1970, but his mother, then Mrs. Ed Raleigh, sent him to Canterbury School where his father had gone. There he was a captain of the hockey and track teams and co-editor of the school newspaper. He went on to graduate from Williams College, majoring in economics and art history. He began his career at Chemical Bank and built its investment banking business as it grew larger through mergers with Manufacturers Hanover and Chase Manhattan Banks. He ran Chase’s investment banking operations, and after another merger, became vice chairman of JPMorgan Chase. 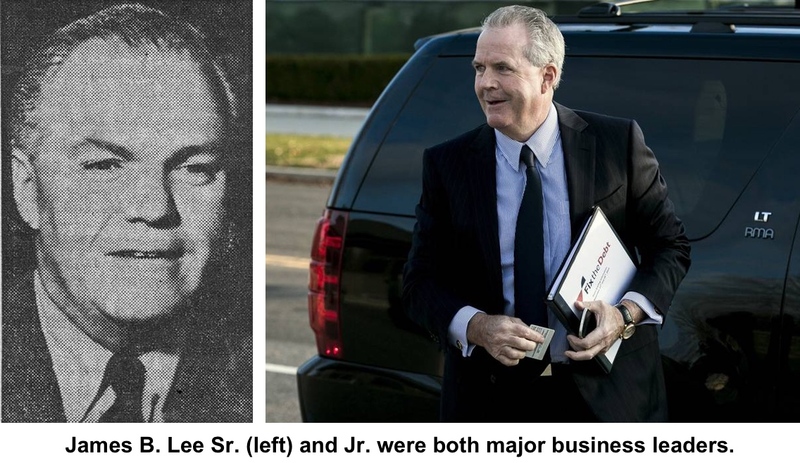 Jamie Dimon, his boss at JPMorgan Chase and also a close friend, looked to Lee constantly for advice. But Lee often offered more than advice. When Dimon was going through difficult times because of a Justice Department investigation, Lee arranged for Tom Brady, the New England Patriots quarterback, to call Dimon to cheer him up. Jimmy Lee died in 2015 at the age of 62. His funeral in St. Patrick’s Cathedral in Manhattan was presided over by Cardinal Timothy M. Dolan. The honorary ushers were a Who’s Who of leading business people: Michael R. Bloomberg, the billionaire ex-mayor of New York; Barry Diller, the media owner; Roger Goodell, commissioner of the NFL; Jeffrey Immelt of GE; Charlie Rose, the TV host and a longtime friend; and Stephen A. Schwarzman, head of the huge private equity firm, Blackstone (Schwarzman had offered him a more lucrative job as #2 at Blackstone, a post Lee declined because he loved his work at JPMorgan Chase). But perhaps the most touching tribute came from his son, who told how his father left notes for him and his two sisters before catching the 5 a.m. train from Darien to Manhattan each morning. He also described his dad’s guitar talents, and how he would practice for performances with a band of JPMorgan staff members, called the Bank Notes. “He was a star, he was a superstar, and he went out at the top of his game,” said his son, whose name is also James. His dad had also been the best man at his wedding.